Download PSC Lab Assistant Exam Answer Key 15/9/2018 (Kollam, Kottayam, Palakkad and Kannur districts): Kerala PSC will be conducted the Kollam, Kottayam, Palakkad and Kannur District of Lab Assistant Exam 2018 on September 15th, 2018 Saturday. Large number of candidates from 4 districts will be attend the exam on 15/09/2018. 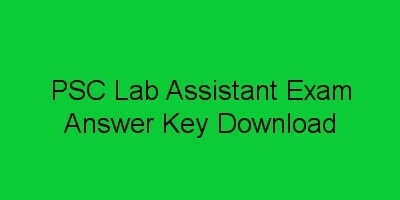 Candidates can download the Lab Assistant Exam 15.09.2018 Answer Key from PSC website www.keralapsc.gov.in / www.brilliancecollege.com. Candidates can download the Lab Assistant exam 2018 answer key (15-09-2018) from PSC website.